Thanks for visiting ME2: Monday Enterprise 2.0…my weekly foray into exploring professional and personal topics on the tip of my mind. I have been using the term “Horizontal Collaboration” recently to describe to colleagues a key objective of our Enterprise 2.0 efforts – better enabling cross-silo community collaboration. 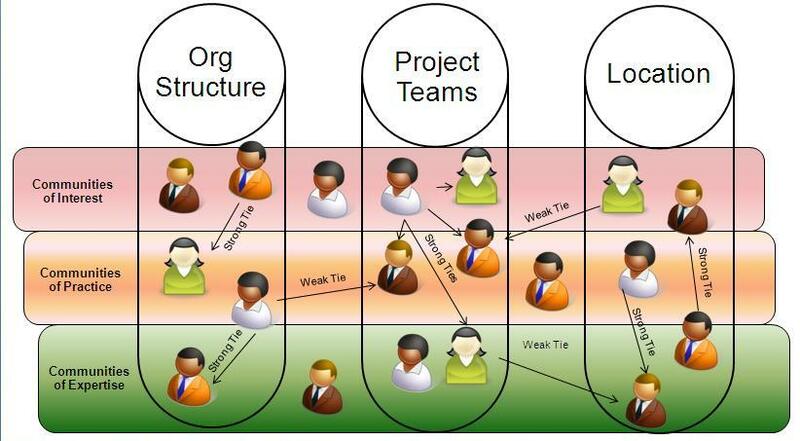 This illustration also incorporates Andrew McAfee’s E2.0 Target Analysis concept to demonstrate the opportunity of encouraging culture and technology to better enable Horizontal Community Collaboration – significantly higher throughput of converting Potential Ties into Weak and Strong ties. I am not pretending that the Enterprise 2.0 “movement” invented communities. Workers in the corporate environment have certainly operated in horizontal communities longer than I’ve been around, however, the means by which these communities have had to populate/share/communicate/persist have been a rate-limiting factor. Community originators and participants have been forced to work with business capabilities and culture rooted in Vertical Collaboration, resulting in high entry barriers, poor participation and attempts at knowledge sharing left poorly consumed, etc. Technology tools targeted at Horizontal Collaboration in combination with more transparent work behaviors can turbo-boost the benefits of organic communities within an organization. It is also important to point out that advocating Enterprise 2.0 / social collaboration isn’t necessarily the equivalent to denouncing all forms of Vertical Collaboration. Each have their value and their place for particular types of work. Advocating Enterprise 2.0 / social collaboration is the recognition that we’ve found something effective at filling in the knowledge gaps left by traditional Vertical Collaboration methods that prevent organizations from maximizing the capacity of their people. Thus, encouraging the use of capabilities and behaviors that fill those gaps – Web 2.0 / social media inspired methods proving to be effective for Horizontal Community Collaboration – will complement your traditional collaboration methods well. The trick then becomes 1) Aggregating the user experience of both styles of collaboration as to not add clutter to already inundated employees and 2) Education on easily identifying the unique merits of each method and how to make choices to maximize their contributions within each. Most blogs that are authored and published within Lilly’s collaborative environment are either 1) Authored by a single person or 2) Authored by a small group of people but for the intent of pushing knowledge out to people not a part of the small group. This week I came across a team using our blog platform in a slightly different manner and I thought it was clever. They had a team blog they used for communication within their team amongst one another, but they had the security open so others could read and benefit from their internal team conversations. The team was using this technology platform in place of an email distribution group (no more Reply-To-All-athons!). Obvious benefits include single instance of a message instead of many, transparency of responses and resulting conversation and long-term storage for history retrieval. Email distribution lists with many replies and difficult to track response threads drive you crazy? Consider this approach if possible for you. Social Media in Life Sciences – Not new, but I read it this week! “The Social Workplace – Employees who actively share their knowledge emerge as experts, and companies that encourage employees to share their expertise build stronger peer-to-peer networks, accelerating internal productivity gains.” My experience with the Enterprise 2.0 Adoption Council is certainly a testament to this statement. This entry was posted in Reading Reactions, Social Collaboration, Sports, Working Out Loud and tagged community_management, Enterprise_2.0, horizontal_collaboration, LOST, olympics. Bookmark the permalink. ← ME2: Can We Afford Not To?